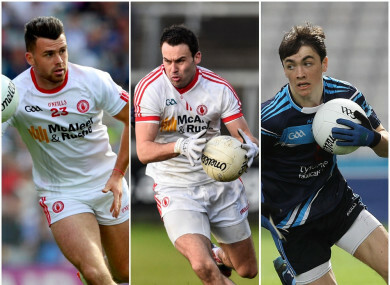 There'll be plenty interest in how these Tyrone forwards fare. THE PRESENCE OF Peter Canavan’s son on the bench and the return of a couple of highly talented forwards to the starting team mean that Mickey Harte’s opening Tyrone selection for the 2019 season carries plenty interest. Tyrone commence their Dr McKenna Cup campaign tomorrow night, travelling to Celtic Park for a Section C clash with Derry that throws in at 8pm. Harte has unveiled his starting fifteen which is noteworthy for the inclusion of Kyle Coney at centre-forward, Darren McCurry at corner-forward and Darragh Canavan on the bench. Coney was a prodigious minor when Tyrone won the All-Ireland in 2008 and pushed on to the senior side, yet he has not featured for the county since January 2015. McCurry was a mainstay of the Tyrone forward line for several seasons but withdrew from the squad last March due to work commitments. Canavan was a star on the Tyrone team that won the All-Ireland U17 championship last year, scoring 1-3 in the final against Roscommon with his goal a marvellous strike. His father Peter captained Tyrone to All-Ireland glory in 2003, played a key role in their 20045 Sam Maguire success and won six All-Star awards during his career. Conan Grugan also return to the starting side as he is named at midfield in a team that has five players that featured in the All-Ireland final loss to Dublin in September – Niall Morgan, Rory Brennan, Tiernan McCann, Niall Sludden and Cathal McShane. Peter Harte, Conor Meyler, Declan McClure, Ronan McNamee and Ronan O’Neill are all on the bench. Email “Boost for Tyrone as attacking pair return to starting side and Canavan's son named on the bench”. Feedback on “Boost for Tyrone as attacking pair return to starting side and Canavan's son named on the bench”.